The office desk utility for geeks and environmentalists. 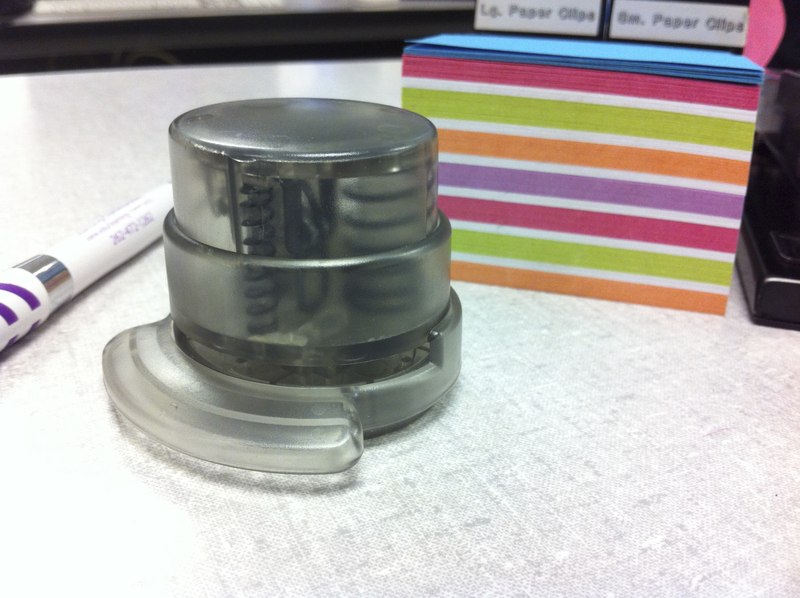 The staple free stapler is meant to replace your normal stapler that uses metal to clasp pieces of paper together. Instead, it uses it’s own genius to slice a small slit into the paper, cutout a small strip, and fold the strip through the slit. It’s a great idea, but it’s more of a novelty. I don’t find it to be practical for two reasons: 1. it’s cheap, not durable 2. it can only bind 2-10 pieces of paper (depending on weight). My normal stapler is needed for most jobs, and today, it’s needed for all staple jobs since the staple free stapler is broken. It’s entirely made of plastic. While in use, an internal plastic piece broke off and is now lodged, obstructing the button to be fully pressed. This unique novelty is great for creating cubicle conversation! It’s priced right at under $10 and you can order yours over at ThinkGeek.